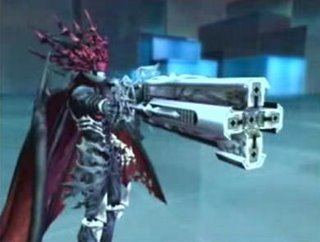 There isn't any kind of idea here, just some images of video game weapons. Not even a suggestion of what mechanism you'd like to see utilized from these weapons to turn them into blasters. In the future, if you're going to post this kind of thing, you should also have some substantial idea behind how you're planning to make the thing from the image real. Strapping 4 double-breeches together for the 2nd one? It's probably such a difficult integration that you won't be making a writeup for people to copy, just post the process images and the final product. Modding some kind of triad and maybe double-dealer into the 1st one? You might be able to make a writeup or printed parts for that.